People who use dryers for drying their clothes need to take care of fires that might start due to high amount of heat generation through them. The two types of dryers – gas and electric, which are quite common in US homes, might not be as safe as you might think. Use of tremendous energy through electric and gas power is capable of generating too much heat to handle by an incapable machine. It is more prominent in the electric ones which have a higher tendency to discharge heat. So, clean dryer vents and lint traps are necessary to ensure such an accident from happening. CPSC (Consumer Product Safety Commission) in the US had researched that more than three-fourths of families used dryers in their homes. These numbers indicate a higher probability for fire accidents from these machines. The ones who used electric dryers had a much higher risk of being inflicted by fire damage versus gas dryers. The two main areas in the dryers where this fire developed were dryer vents and the lint traps. Without cleaning them properly, there were chances of abrupt fire leading to property and life damage. 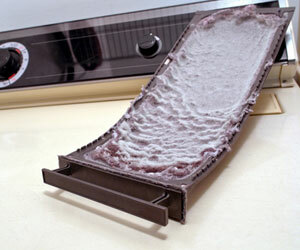 With regular use, lint starts building up in the lint trap area and also the exhaust pipe of your machine. Lint is considered to be a combustible by product. With its conglomeration at the trapped area, there are little chances for the flow of air in order to keep the machine cool. So, without air – the dryer vent liberates a lot of heat which if caught by the lint can lead to fire. Moreover, the duct lines of dryers are usually linked to walls of the house which can further spread the fire through the walls, leading to more property damage. The risk has since been minimized due to regulatory switches for controlling the heat. However, without clean dryer vents, there are chances of such disastrous fires spreading through your houses and injuring you. A lot of easy and useful tutorials can be found online that will help you clean these vents in a capable manner. You can try them out to help develop a safe environment for drying your clothes. After all, the real prevention for such events is in your hands which you need to consider seriously. Feel free to research about such instructions for easy dryer vent cleaning.